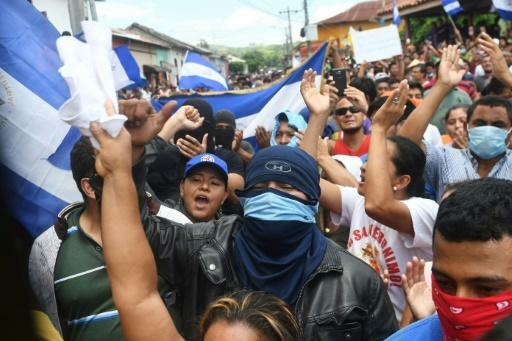 Nicaragua's bishops entered the opposition bastion of Masaya on Thursday in a dramatic show of solidarity with residents they said were threatened with a "massacre" at the hands of forces loyal to President Daniel Ortega. Thousands of people poured onto Masaya's narrow streets to welcome several prominent bishops, who led them through the city in procession behind a statue of Jesus. The bishops -- tasked last month with mediating an increasingly bloody confrontation between the opposition and government -- said they had decided to go to Masaya "to avoid another massacre, give comfort and pray with our people." 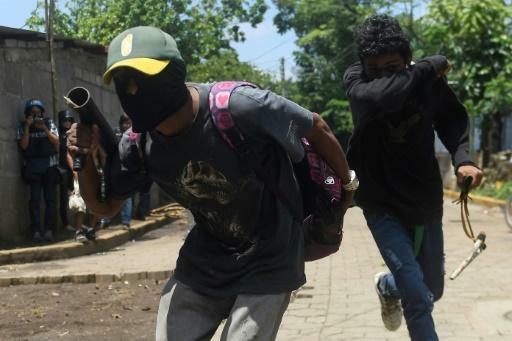 The city just south of the capital Managua -- once a stronghold of Ortega's Sandinista revolution -- has become a flashpoint after two months of anti-government protests that so far have claimed the lives of 191 people. 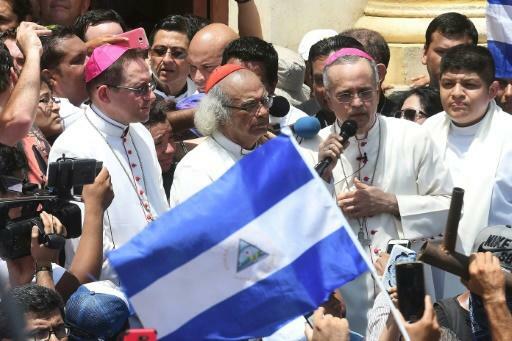 Managua's auxiliary bishop Silvio Baez called on the crowd not to take justice into their own hands, "not to imitate the same attitudes and criminal acts" as the government forces. "We do not want more criminals in Nicaragua," said Baez, a harsh critic of the government. "I want to remind you of one of God's commandments." "To the snipers, to Daniel Ortega and Rosario Murillo: Not one more death," he said. A onetime leftist guerrilla, Ortega led the country from 1979 to 1990 and then returned to the presidency in 2007, now serving his third consecutive term. Murillo, Ortega's wife and vice president, has said her husband "is committed to curbing this wave of terrorism, hate crimes, kidnappings, threats and intimidation." Wrapped in a flag, 40-year-old housewife Yanet Lopez said she could no longer tolerate the pro-Ortega repression. "We want a free country. Daniel should go, we do not want more dictatorship. We are people, not 'criminals', as he says," he told AFP. The city -- which this week declared itself in rebellion to Ortega's rule -- had come under "disproportionate" attack from hundreds of police and hooded paramilitaries since dawn Thursday, a human rights group said. The pro-government forces were using AK47s and Dragunov sniper rifles against civilians in the town, Nicaraguan Association of Human Rights head Alvaro Leiva said. "It's deplorable to see how our brothers are dying," one local resident told AFP in the indigenous Monimbo neighborhood, believed to be the target of the operation. "If we had weapons, it would be weapons against weapons, but this is very unequal. Help us against these murderers who are killing our people," he said. In Monimbo, local residents, who were resisting with homemade mortars, told AFP that government forces had set fire to some houses. The latest round of talks collapsed on Monday, with the bishops and opposition accusing the government of failing to act on a promise to allow international organizations to investigate the violence. Cardinal Leopoldo Brenes, who led the delegation to Masaya, said the talks mediated by the bishops would resume next week. The Church has called on Ortega to allow early elections in March 2019, two years ahead of schedule, in order to ease tensions. The US Ambassador to the UN, Nikki Haley, welcomed Ortega's decision to permit UN and human rights organizations to travel to Nicaragua as "a necessary step." But she said Ortega must ensure full access to these groups "so they can investigate the human rights abuses against the Nicaraguan people at the hands of their own government." "The government must immediately end its campaign of violence and intimidation against its own people for doing nothing more than speaking their minds." "Nicaragua's pain is great. An unarmed people is being slaughtered. The cities are in the hands of bandits," Baez said during his morning mass in Managua earlier on Thursday. At least 23 people have been killed in Masaya, 30 kilometers (19 miles) south of the capital Managua. Riot police and paramilitaries had deployed Tuesday in the historically combative city after its declaration of rebellion. "I appeal to President Ortega to stop the massacre of the people of Monimbo," said Leiva. "It is incongruous to talk about dialogue and to be assassinating the people." Cristian Fajardo, one of the leaders of a student movement spearheading the protests against Ortega's rule, said around 500 "hooded and heavily armed" men had moved into the north of the city at dawn on Thursday. Residents remained inside their homes as riot police and paramilitaries patrolled the streets, firing shots and removing barricades locals had erected.